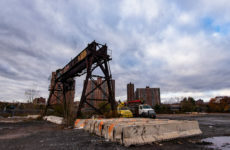 Residents and community board members criticized developers and housing officials at a meeting of Community Board 1 in November, saying that current plans to build where an iconic school once stood will not benefit residents of Mott Haven. The site at 425 Grand Concourse is set to replace the defunct P.S. 31, which was razed earlier this year after the city condemned it, saying it was in a dangerous state of disrepair and could not be renovated. Representatives from development firms Trinity Financial and MBD Community Housing Corp., along with officials from the city’s housing and planning departments, unveiled the plan at the Nov. 9 meeting. 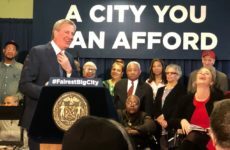 Last April Mayor de Blasio first announced that the site would be developed into affordable housing, as part of his push to create and renovate a total of 200,000 affordable apartments. The plan includes a 28-story mixed-use complex with 289 units of affordable housing, as well as a medical, retail, educational and cultural facility and a charter school. If approved, it would be the first residential housing complex of its size in the city to be powered by passive energy and could use up to 75 percent less energy than if it burned fossil fuel, the developers said. Additionally, mechanized fresh air would be pumped in as a way to reduce asthma triggers. Artifacts from the historic school have been preserved to line a pedestrian connector and Garrison Park Playground would be reopened at a cost of roughly $6.5 million, the development team added. But board members said the income levels proposed would leave the apartments unaffordable for most local residents. The proposed financing plan calls for 10 percent of the apartments to be rented at 30 percent of the federal Area Median Income (AMI), 10 percent of renters at 40 percent, 30 percent of renters at 60 percent of AMI, and 25 percent each of renters earning 80 and 100 percent. “We tend to have a lower distribution of units in the lower-income side,” said board member Cesar Yoc. He and others urged the presenters to adopt wider affordability models so young professionals and low-income residents and families can afford the rents. Thomas Brown, senior development manager at Trinity Financial responded that, if enacted, the board members’ counter proposal could leave the developer short of some of its objectives, such as implementation of the energy efficiency model, because it would require the developer to invest more of its own funds and less city money. Under the current proposal, Trinity would provide about 10 percent of the project’s estimated $140 million cost, while the rest would be paid for with tax-exempt bonds, subsidies and grants. The board also insisted the project create training and jobs for residents. The developers said they are teaming with Hostos Community College to develop a plan to train and hire locals for healthcare jobs at the proposed health facility, and added they would coordinate with Lincoln Medical Center. Some were nervous that the building’s massive scale would be out of proportion with the rest of the area, dwarfing nearby buildings, but Brown countered that the urgent need for affordable housing should outweigh that concern. 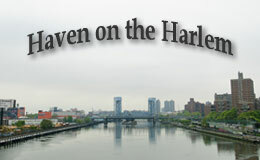 “We are trying to maximize the amount of community benefits that’s needed from that site,” he said, adding that other large-scale projects slated to be built along the Harlem River waterfront factored into their decision. “The deeper you go in affordable housing, the more subsidy you need,” said Ted Weinstein, the housing department’s director of Bronx planning. Others were leery of the developers’ choice of Wavecrest Management to manage the building. 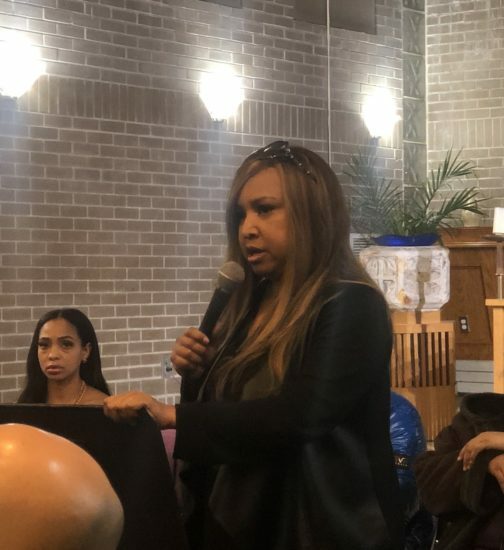 The mention of the firm’s name sent murmurs across the room, stemming from complaints Mott Haven and Melrose residents have raised with the board over the years that the company is unresponsive to tenants’ needs and complaints. But the developers countered that Wavecrest’s portfolio is strong. The developers concluded by trying to reassure the board that they would consider the concerns raised and will come back soon with responses. At a subsequent meeting of Board 1 a week later, Housing Committee chair Arline Parks complained about the city’s lack of transparency in choosing a Boston-based developer, Trinity, without input from the community. The site at 425 Grand Concourse is set to undergo the city’s Uniform Land Use Review Procedure (ULURP) next spring. The story was updated on Nov. 18.